McHale was born in Plano, Texas to Christopher McHale and Elizabeth Payne, the youngest of four children. McHale is descended from immigrants from County Mayo, Ireland. He grew up with actress and singer Demi Lovato. He attended Academy of the Canyons High School in the Santa Clarita Valley in California. Before becoming an actor, McHale joined the American boy band NLT, which stands for "Not Like Them". They were discovered by Chris Stokes in 2006, who subsequently signed them to his label, The Ultimate Group. On March 13, 2007, they released their first single, "That Girl". The following month, they opened (with Chantelle Paige) for The Pussycat Dolls. The band also made a guest appearance in the film Bratz: The Movie as an auditioning band. While in the group, McHale, along with Timbaland and his bandmates, co-wrote the song "She Said, I Said (Time We Let Go)". On April 30, 2009, member Travis Michael Garland announced that NLT had split. McHale, who has a record deal with Universal Music Group, writes original music in his spare time. In an interview with Mario Lopez, McHale stated that he plans to pursue solo music post-Glee. In 2015, McHale, Chris Moy, and Justin Thorne co-wrote the song "Heartless" which was featured on the latter's debut EP The Heartbreaker. That same year, he starred in the music video for Thorne's song "Summer Nights". In 2007, McHale made a guest appearance on NBC's comedy series The Office in the season four episode "Launch Party", portraying a pizza delivery boy who is taken hostage by Michael Scott (Steve Carell). He then guest starred in three episodes of Nickelodeon's teen drama series Zoey 101 as Dooley Fibadoo. In 2008, McHale guest starred in two episodes of HBO's dark fantasy drama series True Blood, appearing as Neil Jones, a coroner's assistant. 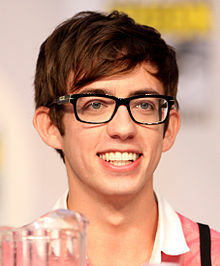 In 2009, McHale landed his breakout role as Artie Abrams in the Fox musical comedy-drama series Glee. His character, who uses a wheelchair after a car accident, joins the McKinley High glee club in the first episode. He had his first solo performance on the show when he sang "Dancing with Myself" in the episode "Wheels". In the episode "Dream On", he danced in a fantasy sequence to "The Safety Dance", and sang "Dream a Little Dream of Me". In the second season episode "Britney/Brittany", he sang a solo (in a dream sequence) of "Stronger", after being anaesthetized for dental surgery. He also danced in a dream sequence alongside Harry Shum, Jr. to Michael Jackson's song "Scream" in the third season episode "Michael". McHale, along with the main cast of the series, was nominated for the Screen Actors Guild Award for Outstanding Performance by an Ensemble in a Comedy Series four times, winning in 2010. In 2010, McHale appeared briefly in One Call's music video "Blacklight" alongside former NLT bandmate Justin Thorne, who was a member of One Call. In June 2011, McHale appeared in Katy Perry's music video for her song "Last Friday Night (T.G.I.F.)" as the character Everett McDonald. On July 22, 2012, McHale co-hosted the 2012 Teen Choice Awards with Demi Lovato. In January 2014, it was reported that McHale would host a comedy panel show, Virtually Famous, for the British digital television channel E4. The show also features comedian Seann Walsh and radio presenter Chris Stark as series regulars and team captains. On February 24, 2014, it was announced that McHale had signed on to play a supporting role in the Kathy Bates and Dustin Hoffman led independent film Boychoir. McHale's character, Wooly, is a young music teacher who helps a troubled young boy at his school. In July 2014, it was announced that he and Aaron Tveit had signed on to star in the comedy film They Might Be Kennedys. McHale will play one of the leads, Teddy Mulligan. In April 2016, McHale joined the cast of Dustin Lance Black's drama miniseries When We Rise as AIDS activist Bobbi Campbell. In September 2012, McHale and his dog Sophie appeared in a PETA ad campaign, promoting the adoption of shelter animals. In June 2016, the Human Rights Campaign released a video in tribute to the victims of the 2016 Orlando gay nightclub shooting, in which McHale and other celebrities told the stories of the people killed there. In September 2016, he co-created the mobile app +ONE, created with the intent to "provide people with one app to simplify the process of creating events." He resides in the Hollywood Hills in a $1.025 million mid-century home. In April 2018, McHale came out as gay with a tweet. He is dating actor Austin McKenzie. 2005 All That Mark Episode: "On-Air Dares"
2007 The Office Delivery Kid Episode: "Launch Party"
2018 Nailed It Himself Episode: "First Date to Life Mate"
^ "Glee: Kevin McHale". Wetpaint. ^ Clarke, Kristyn (May 2015). "Kevin McHale Talks DASH Radio Show "Sick Of My Own Voice", Saying Goodbye To GLEE And More!". PCM World News. ^ Live with Regis and Kelly – August 5, 2011 episode. ^ "Demi Lovato Talks Hosting Teen Choice Awards With Friend Kevin McHale". MTV News. July 23, 2012. ^ "Pussycat Dolls were pretty tame". Evansville Courier & Press. April 11, 2007. ^ "She Said, I Said (Time We Let Go)". Warner/Chappell Music, Inc. 2014. ^ "Interviews: Kevin McHale". iHeartMedia. February 9, 2015. ^ Ashagre, Aggi (September 4, 2015). "Former 'Glee' Star Kevin McHale Makes His Musical Return With Justin Thorne on 'Summer Nights': Exclusive Video Premiere". Billboard. ^ "16th Annual Screen Actors Guild Awards scorecard". Los Angeles Times. January 23, 2010. Retrieved January 24, 2010. ^ Mapes, Jillian (June 13, 2011). "Katy Perry Parties With Rebecca Black, 'Glee' Cast in 'Last Friday Night' Video". Billboard. ^ "Kevin McHale to Co-Host Teen Choice Awards". TV Guide. July 22, 2012. ^ Fletcher, Alex (May 19, 2014). "Glee star Kevin McHale to host new E4 panel show". Digital Spy. ^ Finbow, Katy (November 26, 2014). "Glee star Kevin McHale's Virtually Famous gets two more series from E4". Digital Spy. ^ Kilday, Gregg (February 24, 2014). "Debra Winger and Eddie Izzard Join 'Boychoir'". The Hollywood Reporter. ^ "Aaron Tveit & Kevin McHale Headed to Hyannis Port for Big Screen Kennedys Comedy". Broadway.com. July 14, 2014. ^ Goldberg, Leslie (April 26, 2016). "ABC's Gay Rights Mini Enlists Michael K. Williams, Sets All-Star Guest Cast". The Hollywood Reporter. Retrieved April 27, 2016. ^ "Kevin McHale & His Super Cute Dog Stump for PETA's Pet Adoption Campaign". Access Hollywood. September 6, 2012. ^ Brown, Jay (June 29, 2016). "49 Celebrities Honor 49 Victims of Orlando Tragedy". Human Rights Campaign. Archived from the original on July 1, 2016. Retrieved June 30, 2016. ^ "GLEE's Kevin McHale Launches New App Available Today on App Store". BroadwayWorld. September 19, 2016. ^ Beale, Lauren (April 18, 2012). "'Glee' star Kevin McHale dances into Hollywood Hills". Los Angeles Times. ^ "Glee's Kevin McHale Comes Out...With Help From Ariana Grande | E! News". Eonline.com. 2018-04-20. Retrieved 2018-06-14. ^ Harrison, Lily (May 10, 2018). "Kevin McHale Opens Up About His Boyfriend and Why He Was Never Hiding His Sexuality". E! Online. Retrieved July 5, 2018. Wikimedia Commons has media related to Kevin McHale.